To celebrate the opening of the William Wegman exhibition “Hello Nature” at the Artipelag art hall east of Stockholm, Acne Studios and William Wegman are happy to offer 100 prints, numbered and signed by the artist, for purchase exclusively at www.acnestudios.com/wegman from May 24th at 3 pm (GMT). All profits will be donated to Heifer International, a global nonprofit with the goal of ending poverty and hunger in a sustainable fashion. Heifer International was established in 1944 and gives out gifts of livestock, seeds and trees and extensive training to those in need. 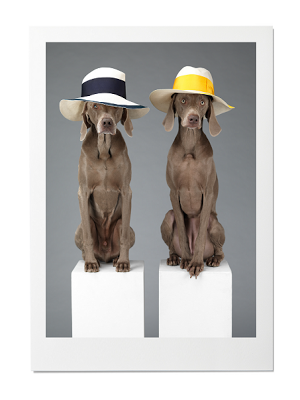 This exclusive print, “Hat Dogs”, is taken from “The William Wegman and Acne Studios Port­folio”, a special project shot by the artist in his New York studio in January 2013. The portfolio features his famous Weimaraners wearing pieces from Acne Studios’ Spring/Summer 2013 Collec­tion. Acne Studios and William Wegman have been in collaboration since the photographer was interviewed and commissioned for the 5th issue of Acne Paper in 2007. William Wegman is an artist and photographer probably best known for his work with his Weima­raners. He started photographing them in the 1970s when they kept getting in the way of the shot. Since then he has experimented using his them as subjects, muses and creative collaborators Their long lanky limbs, deadpan expression and elegant grey coats have made them icons both inside and outside the art world.